Finally, the Tyent Rettin MMP 11 Plate Turbo Extreme is here and it has power galore. Packing up to 750 watts of power, the Tyent Rettin MMP-11 offers you the best of both worlds with its Hybird solid/mesh plates. With all these features working together synergistically, the Tyent MMP-11 promises to produce the water with highest and lowest pH levels without salt. Along with its 11 plates it comes with power supply that is almost twice as powerful than the Tyent 9090 Turbo. You will still get varying levels of alkaline water for drinking and cooking and the regular acid water for face washing and general cleaning as you would from the Tyent RETTIN MMP-11. You can expect to notice new found energy levels as you consume this water since your body will be blessed with lots of oxygen. At this stage you should have done your home work and examined the facts pertaining to the <> benefits of drinking alkaline water<>. Some people simply started drinking this water from a friend and experienced it for themselves and became convinced of its benefits without having reading anything. However if you are not aware of the many benefits please read about the <> benefits of drinking negatively charged alkaline water<> or you can read one of the many well researched <> books on the subject alkalizing your body<>. <> <><>One touch of a button: enables to start and stop water supply without any other operations, and divides and displays alkaline water and acidic water by seven colors. 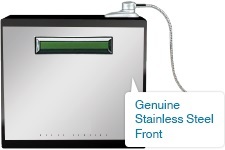 Users can more easily use the MMP-9090 TURBO Water Ionizer since it is coated by touch panels and its functional selection is displayed by icons. <> <>Voice guided service: Warning voices enable to more safely and conveniently use the product for the explanation and safety of various functions. Safety examinations are conducted according to the setup conditions after the installation of the MMP-9090 Turbo Water Ionizer, and voice guides are done in case of impropriety. The energy generated in supplying necessary water basically controls the propagation of micro-organisms and keep the optimal status through its automatic cleaning function. 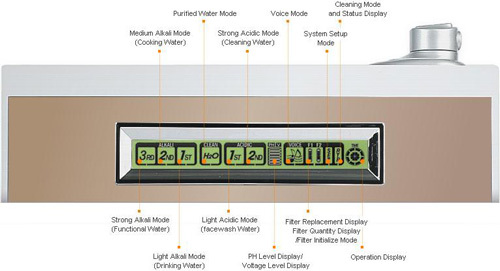 <> <>Built-in CPU chips: All actions of the reduction water appliance are all automatically controlled by the semiconductor CPU chips which automatically seek and control the best operating conditions in consideration of current quantity and water quality. The Tyent is one of the first companies in the industry to have an automatically controllable SMPS method power supply. The power provided to each part is monitored at the CPU chip and is safely supplied to maintain the safe use of the function of the product. 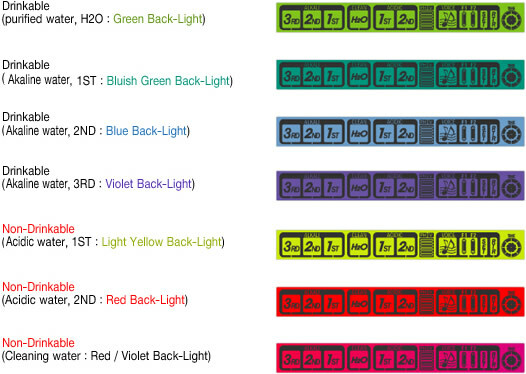 <> <>Nine electrodes: made of dream material, platinum and holed titanium. The use of new materials of platinum and titanium for the electrodes of the electrolytic tank, the core part of the reduction water appliance, extends its life span and heightens the ratio of generating hydrogen. <> Phi water type purifying filters: The filters consisting of the 1st high efficient filters and the 2nd functional filters realize the best clean water status fitted to serviced water. The first filterr is the Primary Active Carbon Filter (ACF). 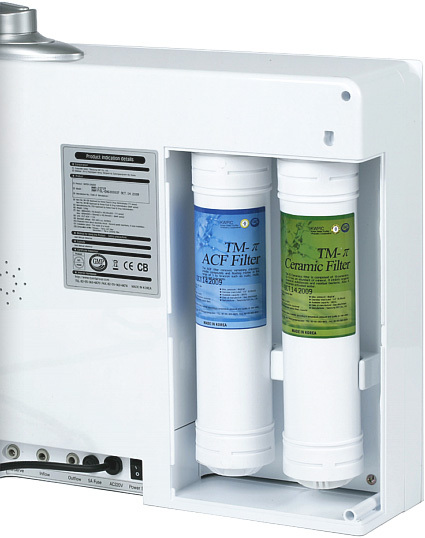 This filter filters relatively large suspended matter like rust and dregs, residual chlorine in water, and volatile organic compounds. M ceramic: keeps the balance of ions. It is anion ceramic. P ceramic: It has plenty of inorganic minerals and gives good heat conductivity, and dissolves nutrients well to convert into the ingredients for human body to react well. Thus, it improves metabolism of human body. K ceramic: It has plenty of mineral and makes water stable because this ceramic has been baked from the clay fermented by TM. The filters have a 3,600 liter cycle (equivalent to 6 months) by the standard of the passing water quantity of 20 liters a day. Filter change cycles are designed to be displayed by voice guides and LCD icons to be easily known. 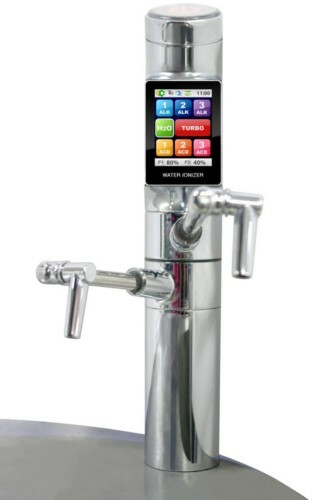 The water produced using the TURBO function is not intended for drinking, never drink this type of water. While operating in the TURBO function, the machine automatically stops dispensing water after dispensing for 5 continuous minutes. Plates Solid/Mesh Hybrid 11 plates dipped and baked. Plates Size 7" x 4 3/4"
Power Settings 4 Alkaline, 3 Acidic, 1 Neutral (including Turbo). Fully adjustable with 55 presets. Retail Pricing Full retail $4,295—Ask about sale prices! Primary - ACF activated carbon fiber. 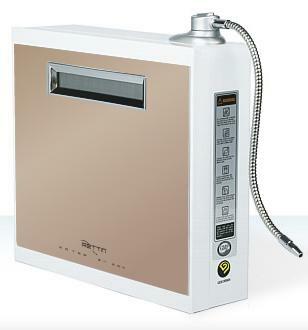 Massive discounts on select Tyent water ionizer, including the Tyent MMP-9090, Tyent UCE-9000 Turbo, Tyent MMP 11 Plate, and the Tyent UCE 11 Plate. Please call for better understanding. 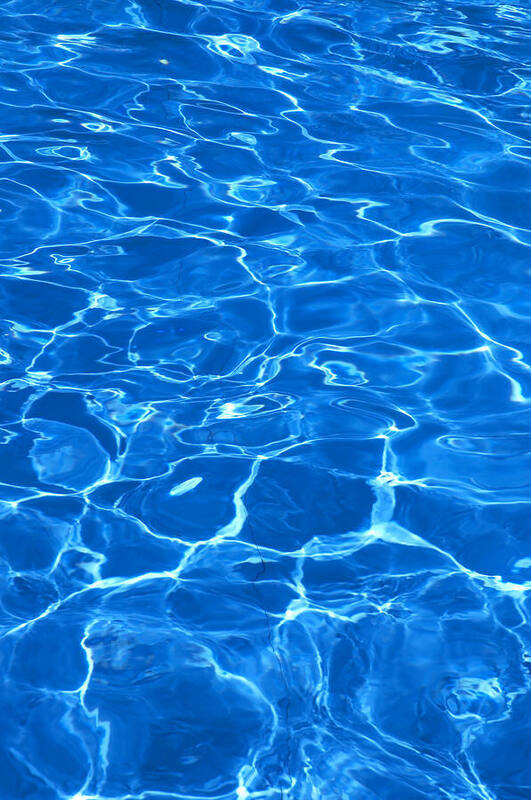 Drinking healthy water is not all you should be concerned with; your bath water is just as contaminated. This is why we have included a shower filter with your bonus. 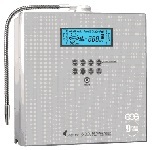 When you travel you might not want log an ionizer with you to your summer get away, so to continue drinking alkaline water we have included one of our best travel ionizer, the Waterman H2Go Portable Alkaline Water Ionizer. <> In addition to this wonderful bonus package we will also send you one extra pair for replacement filter cartridge. This is a real treat. Just think about it, when your machine needs a new filter you will have a pair on hand for you to use. Please note that these testimonials are only for educational purposes. Unless otherwise stated please consider all the statements on our web site as not been evaluated by the Food and Drug Administration. The products mentioned on this site are not intended to diagnose, treat, cure, or prevent any disease. Information and statements made are for education purposes and are not intended to replace the advice of your family doctor. Don't buy from any where else until you give us a <> call!